The Beginning of the End? - - Or The End of the Beginning? Or The End of the Beginning? Those of us who have been either directly involved in, or on the periphery of, the pharmaceutical industry over the last decade have seen at first hand a dramatic change. Times change, and technology changes. Take computer data storage for example. Not so long ago, the floppy disk was state of the art, replaced by the CD-ROM, and then by the USB drive. Easier to use, faster to write information to, capable of storing more data, and at a cheaper price per GB. In a similar way, the pharmaceutical industry has seen change, one driven by an underlying desire to increase productivity in research and development activities, ultimately resulting in lower cost per kilogram of material produced. This presented a unique challenge to managers and scientists within the industry. To be competitive with the new breed of CRO and CMO companies utilizing low cost labor bases in countries like India and China, they needed to find new, innovative ways to deliver cost competitive research and development activities. To look at this from another perspective, could it be that we are witnessing the evolution of the way chemistry itself is being done? The discovery area of pharmaceutical research and development has been through a number of significant changes and innovations over the last decade or so. 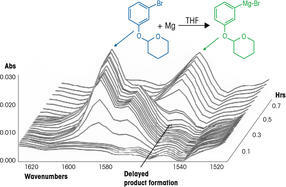 Combinatorial chemistry was a technique which found a great following as a mechanism to make large numbers of compounds for screening, only for companies to quickly decide there was in fact a better way. So attention was turned to the synthesis of smaller, more focused compound libraries. As scientists changed their focus they developed a number of technologies to help them get to their end goal faster – technologies like synthesis robots, MiniBlock™, as well as a number of new purification techniques. More recently, flow chemistry has been utilized as a chemistry enabler, giving chemists greater access to reaction conditions that were previously hard to achieve. As these scientists went through the evolution of their methods, they left a lasting change on the way chemistry was performed in the industry. A ReactIR™ waterfall plot shows the delay in formation of a Grignard after addition of 5 % Ar-Br substrate. The relative peak heights can be trended over time to indicate starting material consumption, product formation or reaction stalling in real time. Broadly speaking, chemical processes can be divided into two groups – batch and flow. Flow chemistry has been used in the chemical industry for a long time, and is finding increased use in the pharmaceutical industry. Reaction conditions that are challenging to achieve in a batch reactor can be easier to achieve in a flow reactor, so chemists can use flow reactors to gain access to a number of ‘enabling’ chemistries like ozonolysis reactions for example1. But the fast optimization of these reactors can be difficult to achieve, as it tends to be an iterative, time-consuming process due to the time taken to analyze offline samples. 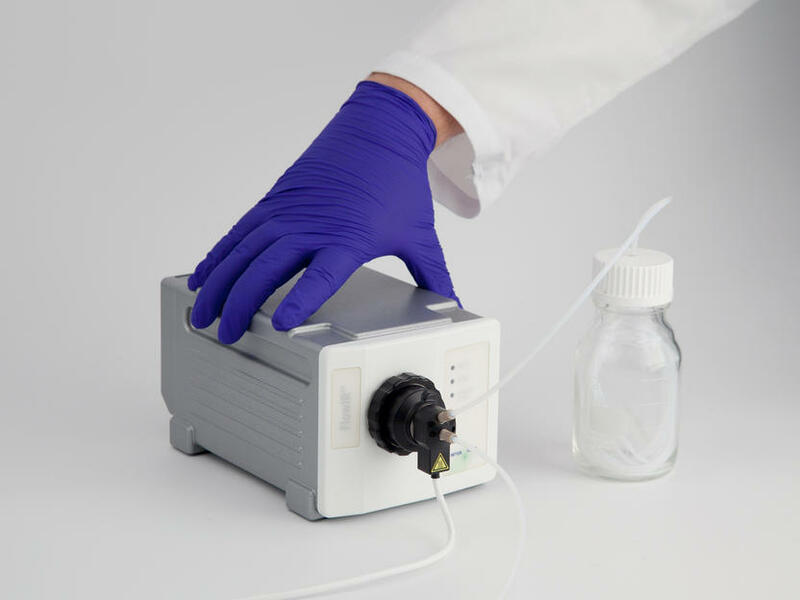 So a method was developed to use a ReactIR™ coupled to a DS Micro Flow Cell to gain structural information in real time, enabling a dramatic reduction in the time taken to optimize the reaction in the flow reactor2,3. Scientists must make good, early decisions on process parameters, and to do this they are increasingly using a number of technologies to provide critical information for the development of the process. For a number of years jacketed lab reactors connected to cryostats have been used for chemical development investigations at the one liter and above scale. In fact, there has been a real gap between the small scale and these one liter plus vessels. 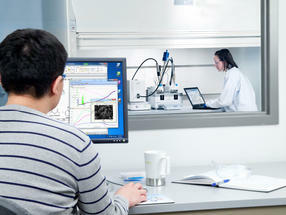 So a new group of synthesis workstations was developed to fill a critical need in this area. Designed as a replacement for the round bottomed flask, EasyMax® removes the need to use heating mantles, oil baths, ice baths and cryostats. Put simply, it is just easier to do chemistry in one of these systems, so chemists themselves can run more reactions and learn more about the process they are developing faster than before. But it goes further than ease of use. The system logs data during the course of the experiment, and helps the detection of non-scalable reaction parameters early during the investigation. The Lab of the Future? 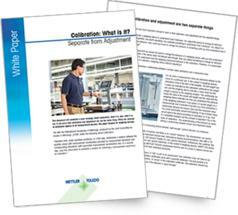 Across industry, increasing productivity and speed in R&D have become key factors requiring equipment and software that provide an increased number of successful experiments with more information per experiment. In addition, integrating information and communicating across the enterprise will play a major role in improving time to market. 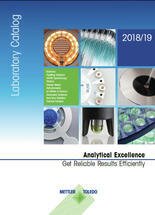 The desire to gain more information per experiment has driven the deployment of a number of ‘smart technologies’ that, when used in conjunction with more traditional techniques such as NMR and HPLC, provide the scientist additional, complementary information, improving process understanding. 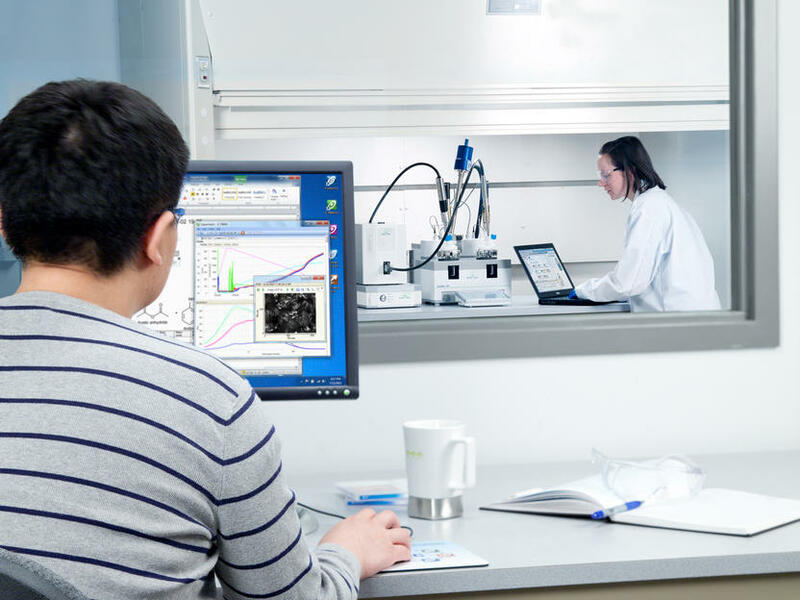 In situ reaction analysis has found favor with scientists for some time as they are able to directly follow the change in concentration of the reaction species themselves – starting materials, intermediates and products, without sampling. This is especially useful when studying reactions that are notoriously hard to sample, such as hydrogenations, or in the case of reactions where there may be a safety hazard on scale-up, like a Grignard reaction5. This technology has become widely accepted over the past decade, and is becoming another standard weapon a scientist can deploy to gain further reaction understanding. FlowIR™ is one of a new generation of instruments that enable the faster optimization and scale up of chemical reactions and processes. Hand in hand with reaction understanding is the determination of reaction kinetics. Here again a new methodology, Reaction Progress Kinetic Analysis 6,7, is enabling chemists to build a kinetic model faster than ever before by reducing the number of experiments required. Purification steps have also seen the increased use of technology to gain greater understanding. Crystallization is probably the most commonly used method of purification, and once was almost seen as an art. Only after the product was isolated was any real analysis done on the outcome, with offline tools like laser diffraction and sieving used to determine particle size. As the use of science behind the crystallization was developed, scientists began to gain a deeper understanding of what was happening inside the crystallization as it was happening by utilizing inline technologies such as FBRM® and PVM®, coupled with computational fluid dynamics to determine how the role of parameters such as cooling rates, seeding and solvent ratios impact the outcome of the crystallization8. The question was The Beginning of the End? Or The End of the Beginning? The answer is – both parts are true. The desire to gain increased quality, reduce cost and increase the speed of development is driving the need to develop new methods of research that meet the requirements of today’s scientists. So yes, it is the beginning of the end for a number of traditional research methodologies and the apparatus that supports them. But it is also the end of the beginning. These technologies are not just new, they have become established as a method that provides key information to the process of investigation, as well as delivering real value for the companies that invest in them, slashing vital time from the development process of a new drug. New technology has arrived, it has proved itself, and its use will continue to grow as the way we do chemistry continues to evolve. ReactIR™ Flow Cell: A New Analytical Tool for Continuous Flow Chemical Processing, Catherine F. Carter, Heiko Lange†, Steven V. Ley, Ian R. Baxendale, Brian Wittkamp, Jon G. Goode and Nigel L. Gaunt, Org. Proc. Res. Dev., 2010, 14, 393 – 404. First publication: Burke, A., q&more, 1.2012.